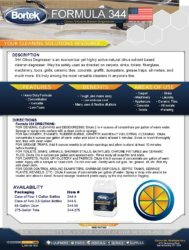 344 Citrus Degreaser is an economical yet highly active natural citrus solvent based cleaner-degreaser. 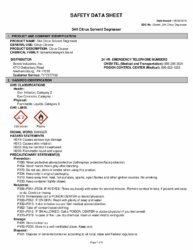 May be safely used as directed on carpets, sinks, toilets, fiberglass, machinery, tools, grills, ceramic tiles, concrete, graffiti, dumpsters, grease traps, all metals, and much more. It’s truly among the most versatile cleaners in anyone’s line. FOR GENERAL CLEANING and DEODORIZING: Dilute 2 to 4 ounces of concentrate per gallon of warm water. Sponge or spray onto surface with a clean cloth or sponge. 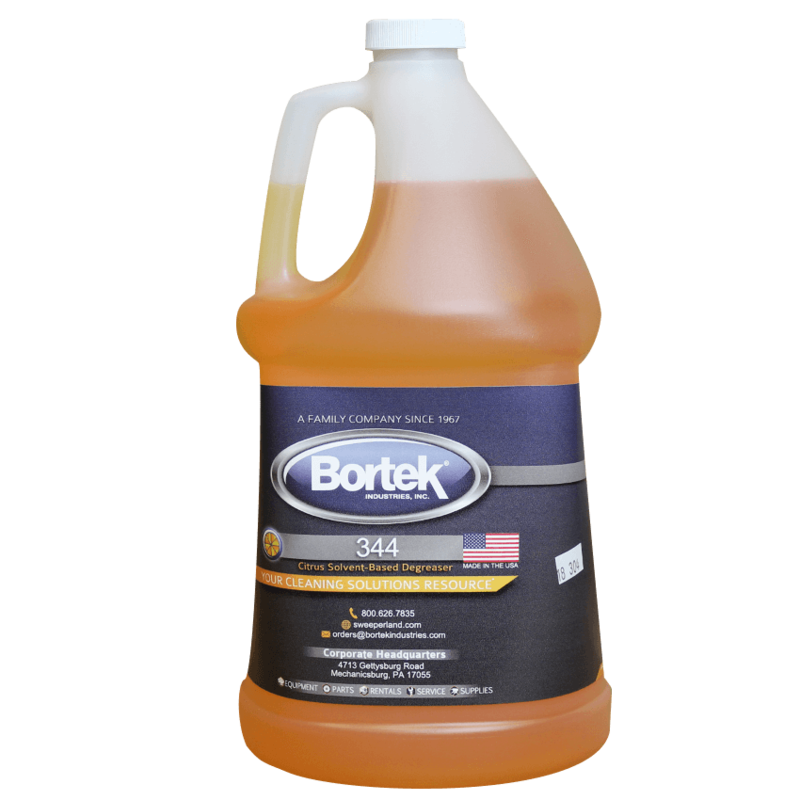 FOR MACHINERY, ENGINES, RUBBER BURNS, GRAFFITI and HEAVY INDUSTRIAL CLEANING: Dilute concentrate 8 ounces per gallon of warm water and allow to stand at least 5 minutes. Scrub or brush thoroughly and rinse with clean water. FOR TOILETS, SINKS, URINALS, SHOWER STALLS, BATHTUBS, CHROME FIXTURES and CERAMIC TILES: Dilute 2 to 4 ounces per gallon and appmoments. Rinse away all soap film and scale. FOR CARPETS, RUGS, UPHOLSTERY and FABRICS: Dilute 6 to 8 ounces of concentrate per gallon of warm water. Apply with a sprayer or clean cloth. Do not over-wet. Gently work out gum, tar, grease, oil, etc. Blot dry with clean cloth. FOR ODOR CONTROL AROUND DUMPSTERS, GARBAGE DISPOSALS, SEPTIC TANKS, SEWAGE PLANTS, KENNELS, ETC. : Dilute 4 ounces of concentrate per gallon of water. Spray or mop onto area to be treated and allow to stand. Around sewage treatment plants apply by the drip method or fogging. PLEASE NOTE: Test a small, out-of-sight portion for all plastic surfaces prior to use.